The Unified Modeling Language (UML) community has started to define so-called profiles in order to better suit the needs of specific domains or settings. 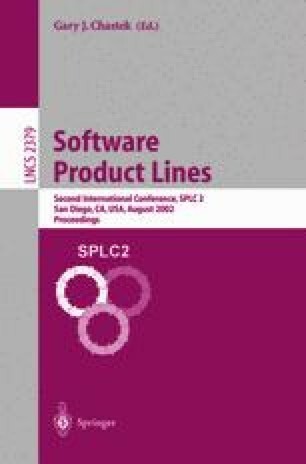 Product lines1 represent a special breed of systems—they are extensible semi-finished pieces of software. Completing the semi-finished software leads to various software pieces, typically specific applications, which share the same core. Though product lines have been developed for a wide range of domains, they apply common construction principles. The intention of the UML-F profile (for framework architectures) is the definition of a UML subset, enriched with a few UML-compliant extensions, which allows the annotation of such artifacts. This paper presents aspects of the profile with a focus on patterns and exemplifies the profile’s usage. We use the terms product line and framework synonymously.